One problem is that every time chicken and potato will be eaten but plenty of curry sauce is leftover. Actually, curry sauce is very tasty, I was wondering if I could use the leftover sauce to make a stew or something. Prepare shiitake mushroom (wash and cut into wedges), tofu (cut into small chunks) and French beans (trim two ends). Pour the curry into a pot. After chilled in fridge for overnight, it already became paste. Also pour in 1/2 – 1 cup water, depends on how thick your curry paste is. Add in some extra curry powder if necessary. Just in case water makes the curry flavor lighter. and also add in 1 tablespoon tomato sauce. Stir gently. When the curry boils, add in shiitake mushroom and tofu pieces. Turn to low heat. 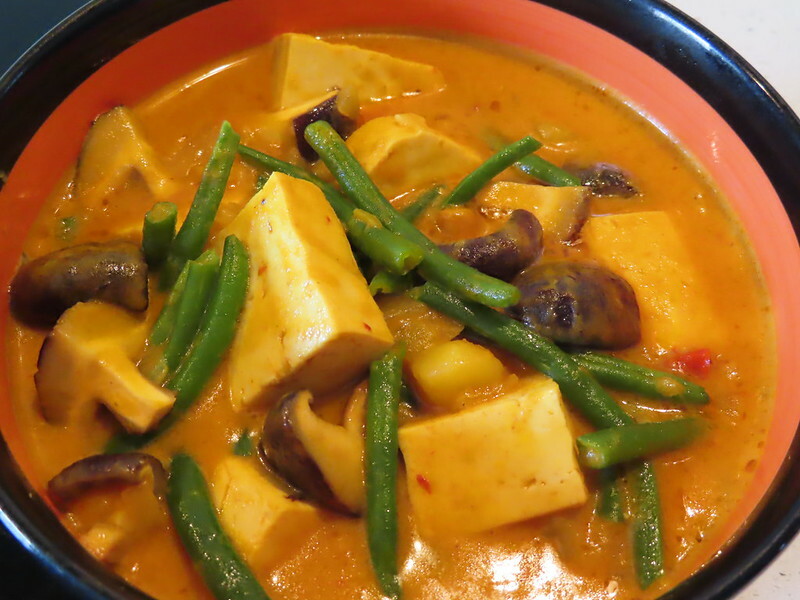 Let the mushroom and tofu braise in curry for a while. Let’s say at least 10-15 mins to make the flavor go in. Put the Frech beans in. You can break the beans into halves if you think they are too long. Simmer for another 5 mins. Tofu is so juicy and full of curry favor. I really like this way to reform curry and also use it to the utmost.